Fast food restaurants like McDonald's and Burger King have been rolling out new donut concepts lately. You might say these eminent patty places are now selling donuts like, uh, hotcakes. And why not? Most fast-food joints already have buckets of oil bubbling in the back, and there's nothing cheaper than dough. 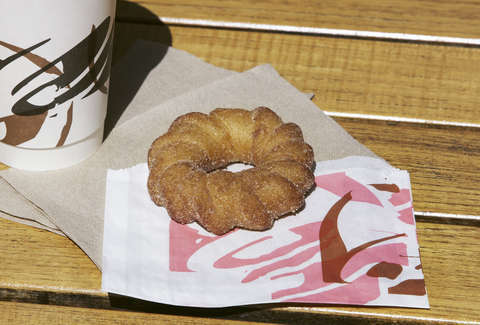 And thus, Taco Bell's Churro Donut. Last week, Taco Bell started testing the $1 donuts in Kansas City, Missouri, with the presumed intent being to gauge whether it deserves a spot among the Quesarito on the permanent menu or gets doomed to the bin along with Grilled Stuffed Nachos. The product is remarkably simple. It's one round loop, like a donut. But spiced, like a churro. "Fusion food," ethnographers call it. The cinnamon-sugar blend very closely resembles the classic Taco Bell Cinnamon Twist, but the receptacle is denser. Maybe a little too dense in the case of two I ordered, which were just a bit too soggy. It kind of ends up with the texture of a fast-food hamburger bun that's been left in the box a longer than it should be, rather than having the fluffy feel you want from a fryer-fresh treat. The spice blend was lightly powdered on, and without any fillings or a dipping sauce -- caramel or hot cocoa would bring the whole thing home -- the oiliness was a bit overwhelming. America's favorite Mexican restaurant has been getting up with the quiquiriquí of the roosters to serve breakfast since March of 2014 -- they're one of the few fast food brands to go up against Mickey D's and successfully claim a chunk of their McMuffin money. And yet, it's weird that it took Taco Bell 5 long years to do this. They have oil. They have a cinnamon sugar mix. Churros are one of the best known and loved staples of the Mexican breakfast. For the team who came up with the legitimately brilliant idea of making taco shells out of Doritos, this should have been a layup. And it still could be with dipping cups of caramel or a thick, cocoa-heavy hot chocolate drink they could probably get away with calling champurrado. Time will tell.